Alas, we must abstain from donkeys for the time being at least. They are addictive, though those who have tried tell me they are an atrocious ride. But donkeys need firm turf beneath their feet, and that is one thing which, in England this lovely May, we are in short supply. For the rain it raineth almost every day. 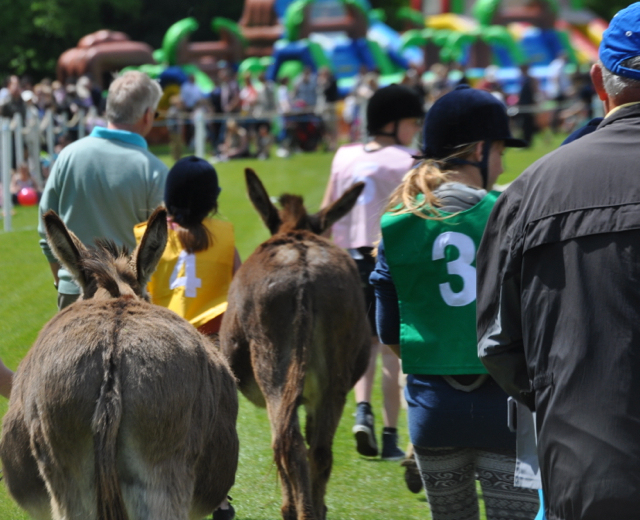 You may well have heard of that oddest of phenomenons, the donkey derby. Second only to those contests where men stuff ferrets down their trousers, the Donkey Derby is, just as it sounds, a derby for donkeys. But while donkeys are great for sedate tethered rides across the beach, they can make the wildest steeds. Families arrive on the green expanse and gaze indulgently at all the flags and balloons and amiable stallholders. This derby is badged up as a Very English Occasion, and thus parents queue up to get their children registered as a donkey jockey. What fun, they smile, and hold the cameras ready for those special moments. But donkeys are not always placid steeds, or at least, the ones I have observed are fiery non-conformists. Jocasta or William or Percival hoists themselves on, teetering uncertainly, and then the starting horn booms. And there must be something about that sound, or possibly someone is waving carrots at the finishing line, for the donkey bolts off harm scarum, hell-for-leather, with no regard for any passenger. Most of the hopeful jockeys have no idea until they are in full flight that every donkey possesses something not found in the rest of nature: an ejector seat. There are several ways one can make one’s money at a Donkey Derby. One can sell food, and books, and toys, and bric-a-brac, and that makes a nice tidy profit. And each donkey which rides is sponsored by a local business or concern. Phil was waiting for us outside church a few Sundays ago. “I’ve sponsored a donkey,” he said with unimpeachable resolution. The advantage – or perhaps, the disadvantage – of living with someone for 20 years is this: that you can follow the labyrinthine workings of their mind marginally better than Perseus. I knew where my husband was heading with this one. I sighed wearily. “What’s it going to be called?” I asked, almost fearful of hearing the answer. Phil grinned. “It shall be called : ‘My very hairy dog‘, he announced with unabashed pride. It transpires that last year, he observed with some considerable interest that the announcer and commentator for every race is none other than the avuncular and much beloved parish priest. Phil, probably the greatest fan of our small opinionated terrier, was most eager to hear Father, on the impressively large sound system, yelling with abandon “And here comes my very hairy dog in the outside lane…” or other such doggerel. It transpired he was too late: all the village businesses had beaten him to the donkeys. And now, the very day before, the field has been deemed as simply too waterlogged to take even one single donkey. Let alone one called My Very Hairy Dog. Posted in Shrewsday MansionsTagged Britain, donkey derby, donkeys, england, festivals, traditions, UKBookmark the permalink. Thank you, Gabrielle, I shall do so. My Very Hairy Dog is a great name. There’s some old American (maybe from the radio days) comedy routine where the announcer is giving a blow by blow presentation of a horse race. My favorite line was “and sticking to the rail is Bubble Gum!” Maybe next year Phil will have his chance again. Ok the donkeys are very sweet, but Men stuff Letters down their Trousers?.. than what do they do! Does your unimpeachable husband do that too? I wrote this just before bedtime as a migraine wound its way out of my life, and I think I wrote Fetters, Celi: and I didn’t check it properly. Ferrets. I meant Ferrets. Is that better or worse, I wonder? I’m very sorry to miss My Very Hairy Dog………. I can see Phil and I share the same sense of humor. It is a wonderful name. This time next year may the My Very Hairy Dog win the Donkey Derby! I’ve met a horse or two that were also equipped with an Ejector seat, probably not as unexpected as the ones donkeys possess. One overgrown donkey propelled me into a perfect somersault and a one-point landing on my coccyx two days in a row. His pathetic excuse was a bushbuck dashing out at us on the first day, and imagining one in the same spot the day after. Fine memories of a wet childhood in England. I can still recall being taken to a point to point by my very horsey god parents…it was in a place called Pepper Harrow and I was only interested in the fire engine that was on display..I think my god parents wondered why God had foisted me on them. Ha! The siren call of the fire engine. Who can resist, Roger? I’d love to hear that hollered at the top of his voice by a member of the local clergy…. Thank you for a wee bit of local culture…..always interesting…..in addition to the marvelous bits of history you share with us. Always look forward to what you have to say. HI Judith: dogs are allowed to come on these days. It’s a treat watching them all pottering around on their leads saying hello to one another: and they give the donkeys a respectfully wide berth. Sorry the field was too waterlogged for shaggy donkeys to slog around, pitching riders via ejector seats to land with a splat on soggy behinds. I know, Nancy. We’re all devastated not to be volunteering….devastated…. All my carrots, er bets, would have been on My Very Hairy Dog, Kate! What fun – and Phil gets a gold star for his cleverness. My mother-in-law, during the deep, dark depression, actually played donkey basketball. Can you imagine that? Aw, and a donkey derby sounds like so much fun too! Dear Kate, you have a delightful sense of the ridiculous and are so wry. I mostly just amble on and on, never able to find the wit that eludes me! Where did you get your wry-and-wit map????? Peace.